VTU Revaluation Result 2017: The Vice-chancellor karisidappa on Sunday announced that the Revaluation results of B.E I, II, III, IV, V & VI Crash/Extricating Semesters. Its a sign of relief to the students from the Visvesvaraya Technological University (VTU) Keenly Waiting for reevaluation results 2017. The Declaration of Odd-semester examination results was delayed which is conducted in December that leading vagueness among students who had getting offer letters through campus recruitment and other MNC Companies and also few students plans to fly abroad to pursuing higher studies. Results were finally declared in early may but students complained that the marks they had been awarded was not a true replication of the handwork they had put in exams. In the mean time, the 8th semester examinations have been postponed from June 5 to June 12. Registrar Evaluation, VTU Sathish Annigeri Stated that All exam for the Under and Postgraduate students will be completed by July 31. 2017. VTU Got 11,000 signatures from students to postponement of their 8th semester exam through online portal. Vice-Chancellor of VTU said reason for the delay in announcement of results he stated that Lack of staff, mingling up of answer sheets of regular students with students who pursuing crash semester and delay in development of software, problems in decoding OMR are the main reasons for this delay, he said. 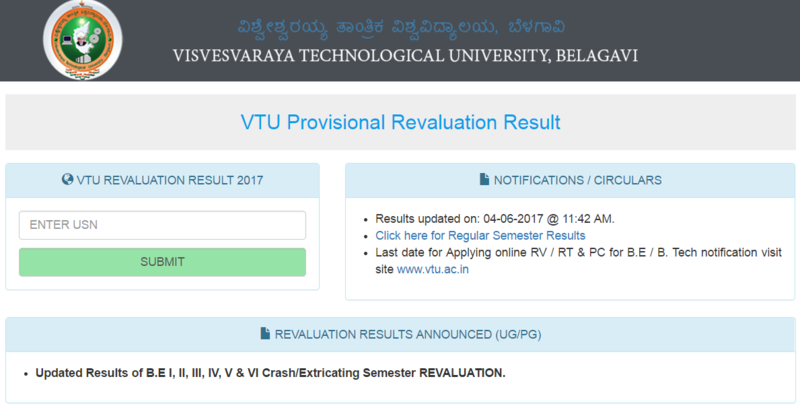 Now Students From Visvesvaraya Technological University can check their Revaluation results for 1st, 2nd, 3rd, 4th, 5th and 6th semester 2017 which is published for VTU Official Results portal results.vtu.ac.in. Students need to enter their registered roll number in that portal. Students Can Check Results from vtu.ac.in. Results updated on: 21-10-2017 @ 11:00 PM. June / July 2017 REVALUATION Results of B.E. / B.Tech I, II, III & IV(CBCS) semester announced for all regions. June / July 2017 REVALUATION Results of B.E. / B.Tech I, II, III, IV, V & VI(Non-CBCS) semester announced for all regions. are you coming to write my exam?